Steph â€œthe Hammerâ€ Hammerman recently visited us up at RockTape HQ, so naturally we couldnâ€™t pass up the opportunity to watch her train withÂ Neal MaddoxÂ andÂ Chris HinshawÂ atÂ CrossFit X-treme Athletics. For those of you who havenâ€™t heard of Stephâ€™s story, check out this CNN interview. We werenâ€™t sure what would happenâ€”filming without a script, a plan, or expectationsâ€”when we joined her at CrossFit X-treme Athletics with Coach and CrossFit Games Competitor Neal Maddox and famed endurance coach Chris Hinshaw. We arrived a bit late so we thought we missed the magic. A TrueFormâ„¢ Treadmill was already set up under a pull-up rig with a Ring ThingÂ®Â hoisted above. Just as we were about toÂ pack it up and cut our losses, Steph casually walks over to the rig and Neal helped her inâ€”using the rings to anchor the harness. We were skeptical about this entire setup. It looked fragile, awkwardâ€¦ we definitely werenâ€™t prepared for this. 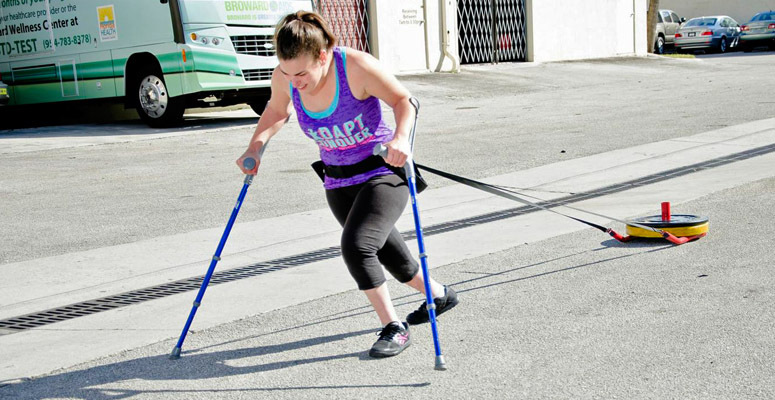 Typically, Steph uses her crutches to support herselfÂ while running. Itâ€™s inspiring, but you can see the struggle. This puts a lot of pressure on her arms and less on her legs. In this moment, she is still supporting herself with the railings, but the power output from her legs is obviously increasingâ€”Chris gives updates on her speed and confirms her mile time has improved. Interestingly, one of the most inspiring moments was watching Steph ask Neal for a little more assistance. With just that bit of extra support from Neal, she was able to let go of the railings and experience something entirely new. She walked without the support of her arms. She wasnâ€™t tackling this feat alone, andÂ at the end of the day, that doesnâ€™t matter. The goal is really to find the best way to trainâ€”period. Sometimes that requires asking for help, which is, in itselfâ€”a hurdle for the best of us. Asking for help is generally the best means of getting to a point where you no longer need it. The Hammer left us with a significant message we feel inspired to pass along: Donâ€™t be afraid to ask a coach for new ways to get the training you need, adaptive or not. Most often, the fear of hearing â€œnoâ€ or â€œcanâ€™tâ€ deters us from necessary steps we need to take to reach our greatest ambitions.